The sound of castanets and Flamenco guitar riffs echo through the streets. I see a momentary flash of a beautiful figure in a black dress sauntering towards, and then she’s gone. Carmen? Is that you again? It seems that every time I eat Spanish tapas and drink sangria she appears. That unattainable Spanish hard body has been haunting my subconscious ever since I first laid eyes on her in a bar in Valencia. There I was, the gringo in the corner of the Spanish nightclub sipping my first sangria. Carmen crossed the room towards me, took my glass and downed it, then led me onto the dance floor. She wrapped on leg around my hip and I melted. 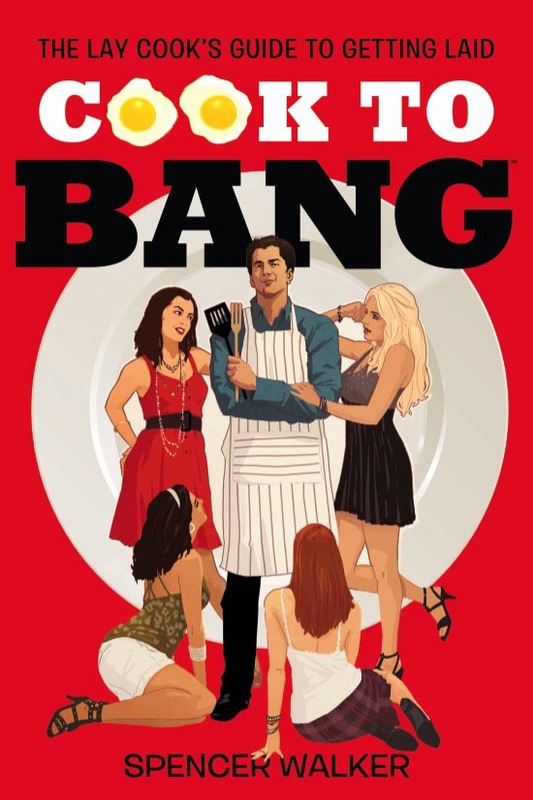 The filthy suggestions she breathed heavily into my ear in her native tongue sent my mind skitso. Carmen sent me for one last round of sangria. When I eagerly returned she had vanished. To this day I don’t know if she was real or a hallucination brought on by a sangria overdose. That is why I make sangria now. Perhaps Carmen will return or, at the very least, I can turn the woman I serve it to into Carmen…for the night. 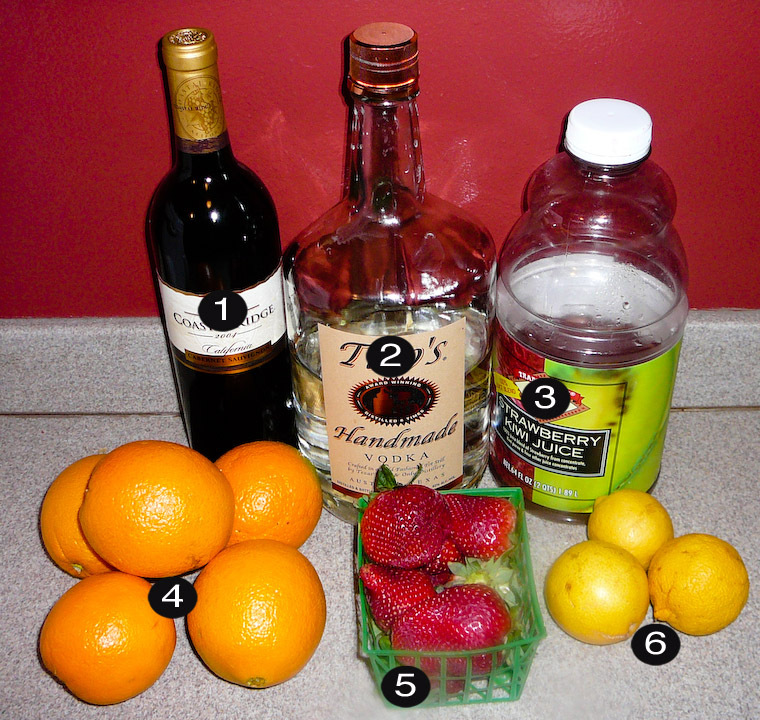 Cut 1 orange in half, and then cut up half moon slices and throw them in your punch bowl. Take another orange and chop it up into little nibbles and toss them in the bowl too. Wash and de-stem the strawberries and chop up more nibbles to join its orange friends. Squeeze the remaining oranges and all the lemons into the bowl and throw away the rinds. Pour all the red wine, vodka and juice into the bowl. Stir it all thoroughly and put it in the fridge. Allow the mixture to cool and the fruit chunks to soak up the flavor (approx 2 hours). 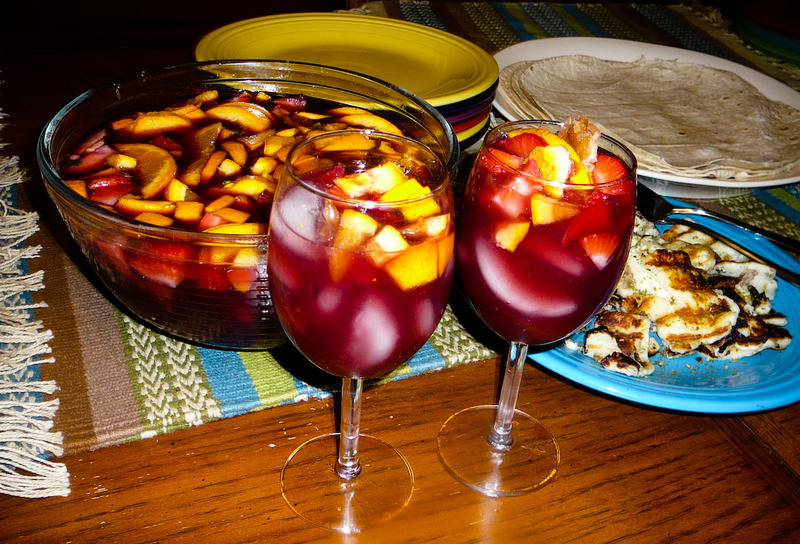 Fill each glass with ice, then ladle in the sangria with fruit chunks. Drink up. Tell Carmen I say HI! Finally, I found the information I was looking for. I have been doing research on this subject, and for four days I keep finding web-sites that are supposed to have what I’m searching for, only to be disappointed with the lack of what I wanted. I wish I could have found your web-site sooner! I had about 30% of what I needed and your web-site has that, and the rest of what I had to have to complete my research. Thank you and keep up the good work! As typical this was a thoughtful article these days. You make me desire to continue to keep coming back again and forwarding it my followers��…. Thank you to the good article. I��ll take the notes you have written….